Nominations called for 2019 Australian Wool Industry Medals - Sheep Central - Federation of Australian Wool Organisations Inc.
Australian Wool Industry Medal nominations are wanted. 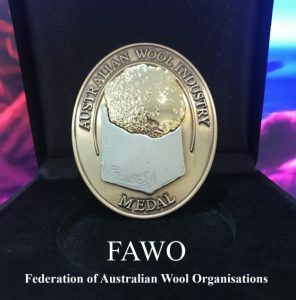 NOMINATIONS have been called for the 2019 Federation of Australian Wool Organisations’ Wool Industry Medal. Multiple Australian Wool Industry Medals have been award to prominent industry figures for the past two years during the annual Australian Wool Industries Secretariat’s Wool Week dinner in Melbourne. Medal nominees are being sought for men and women who have worked in or represented the Australian wool industry and made an exceptional and sustained contribution in the Australian wool industry. Nominations can be made for wool growers, shearers, wool classers and handlers, exporters, brokers or processors, or people from other sectors such as wool testing, market reporting and analysis, administration and regulatory services, education, research or promotion. Secretary of the Federation of Australian Wool Organisations Bianca Heaney said previous medal winners include, exporters, shearers, brokers, sheep breeders, growers and wool testing people. “We’ve got a couple of nominations there at the minute, but we are hoping to get quite a few in this year. Nominations close 3 May 2019 and recipients will be announced at the Wool Week dinner held on 22 August 2019 at the RACV Club, Melbourne.